Happy 20th Anniversary to Gena! 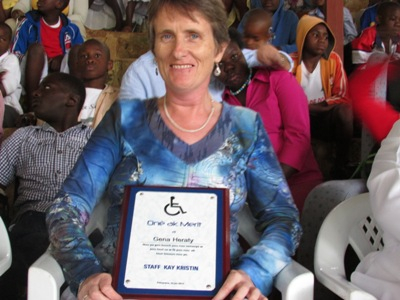 Our very own Gena Heraty, Director of the Special Needs program of NPH Haiti, celebrated her 20th Anniversary this past week at NPH. It seemed only fitting that Gena, and the entire home of St. Helene, welcomed two severely handicapped children into Kay Kristin or Christine House just two days shy of celebrating her anniversary. There was a third child accepted into the St. Helen home whose mother just passed away a couple of weeks before the anniversary. Gena’s anniversary became the venue to introduce and welcome the three newest members of the NPH family. As Fr. Rick Frechette led us in a special Mass before starting the festivities, the two new children sat quietly in their wheelchairs while another sat in Gena’s lap. Joining us that day were staff members, former pequeños, friends, patrons and supporters of our homes in Haiti. Lovingly present were the spirit of all the children who have gone ahead to our heavenly family and remain in our hearts forever. Four days later, the anniversary celebration continued as students, parents and staff of Kay Germaine School honored Gena with speeches, poems and lunch in her honor. It is with exuberant joy that we all wish Gena a wonderful anniversary and our heartfelt gratitude along with our best wishes for the future. We could not have done it without her. As a volunteer to NPH 20 years ago, Gena’s prayer to our Almighty Father was for a mission and her prayer was answered many times over. Proof of the power of her prayers manifest themselves in the number of children in the family, the loving attention she generously gives to children and staff, the growth of the special needs program over the years, the many friends and supporters who help guarantee the sustainability of this vital program and the success of the children in the program. Words cannot describe the tremendous pain she feels and the amount of tears she sheds when a child passes on to the “other side.” However, Gena continues her blessed mission for the many children present and for the many more we hope to serve. In one voice from one big heart, we say CONGRATULATIONS GENA and HAPPY ANNIVERSARY. We love you more than our mere words can express. Thank you for all that you have done and continue to do for the children of Haiti and we wish you many more years of divinely inspired service.